Actors won’t even get scripts of their lines, and they’re literally building a damn wall around the set. Sounds like things are going great! Let’s back up for a second. This past season of Game Of Thrones was upended by a massive hack at HBO, in which shooting scripts were posted online, episodes were leaked early, and generally every possible nugget of insider information about the series was posted online for the world to see. This went over about as smoothly as a vial of wildfire lobbed at a wooden cottage, needless to say, and HBO has decided to respond to its post-hack situation in the same way any gibbering paranoiac would: by going massively overboard and making itself look like a deeply unwell person. First of all, the production is building a giant wall around the set, as Nerdist reports. Curious onlookers say crews are working on “the installation of ‘massive metal walls’ meant to restrict fans and passers-by from sneaking a peek at production.” So, in addition to building a new Winterfell set, the show is building a massive enclosure around Winterfell, which is definitely not a case of weird overkill combined with an ultimately fruitless endeavor that is useless against all those drones they keep shooting down. But set aside your disquiet involving the mental health of all involved in that wall decision, because there’s supposedly a much dumber plan in place to discourage spoilers. 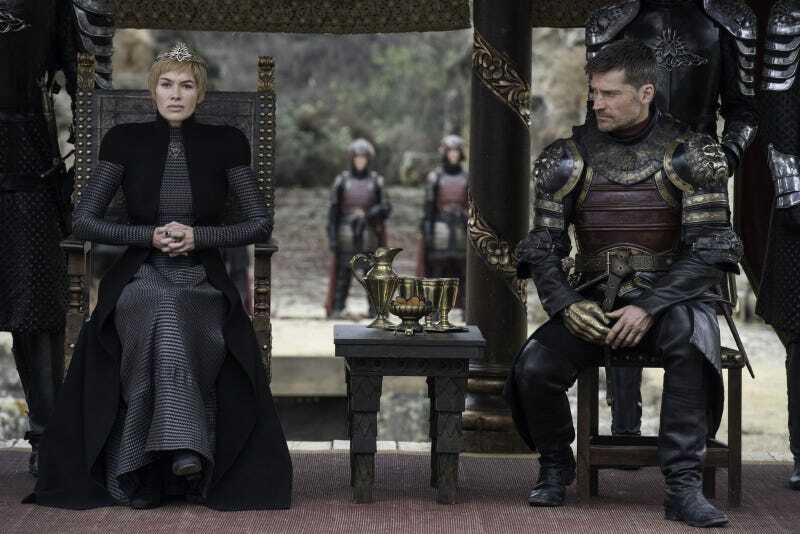 According to The Ringer, Jaime Lannister himself, Nikolaj Coster-Waldau, said during a recent Scandinavian talk-show appearance that actors won’t even be receiving scripts for season eight. Instead, to help prevent leaks, the cast will all be fed lines through earpieces, line by line, as per the famous Stanislavski method of ensuring the worst possible performance. Hopefully, this second report is just a case of an actor trying to mislead people in a no-doubt meaningless attempt to dissuade eager hackers. Given they’re already shooting multiple endings in hopes of evading spoilers, nothing would seem to be off the table when it comes to anti-hacking feints. It’s probably not long until the show starts wearing a tinfoil hat to discourage the radio waves from taking over its brain, and possibly wearing footie pajamas to the grocery store while muttering to anyone who will listen about the stockpile of ammunition its assembled in case the U.N.’s shock troopers come to take its liberty.